A short post this week with just a couple of announcements related to my various gaming endeavors. and check it out. 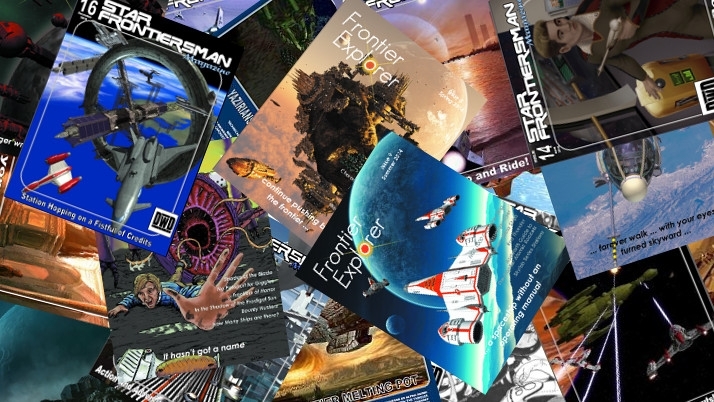 The con is sponsored by this blog, the Star Frontiers Network, and the Frontier Explorer webzine. Right now there is not much on the site as we’ve just opened registration. If you’re interested in playing or, even better, running a game, jump on over and register. And let others know about it as well. The more we can get the word out, the better the turnout and the better the event. As you may or may not know, I run the two Star Frontiers fan magazines, the Frontier Explorer and Star Frontiersman. While I love doing this and will continue to do so as long as I’m able, there is a considerable amount of work involved for myself and my fellow editors. As such I’m launching a Patreon campaign for the magazines to help raise funds to help offset the costs involved and improve the production and quality of the magazines. I’m not going to do a whole “sales pitch” here. You can read the details on the Patreon page. The bottom line is that while the magazines will always be free, by becoming a patron you can make a donation and say thanks for all the hard work. If you like the magazines and want to support our work, consider becoming a patron.